Trig Avionics was founded in 2004 and set out to produce a solid state and energy efficient Mode S transponder. A new generation of transponders were required to meet a European wide mandate for Mode S. At the time aircraft owners had few options available, so Andy Davis and his team changed this. The resulting TT31 transponder set a new benchmark in quality, capability and value. Today Trig manufactures a wide range of avionics for General Aviation. Pilots and aircraft owners worldwide fly with the class leading VHF radios, transponders and ADS-B technology. International Aviation Support is your partner for technical support and installations of Trig equipment. A slide-in replacement for existing KT76A, KT76C and KT78A transponders. Features Mode S and ADSB-Out capabilities. Class 2 Mode S and ADSB-Out transponder. Fits into a standard 2 1/4" instrument hole. Class 1 Mode S and ADSB-Out transponder. 6 Watt VHF radio with 8.33 kHz and 25 kHz channel spacing. 16 Watt VHF radio with 8.33 kHz and 25 kHz channel spacing. 10 Watt stack mount VHF radio with 8.33 and 25 kHz channel spacing. Features airfield database, emergency button and audio playback. 16 Watt stack mount VHF radio with 8.33 and 25 kHz channel spacing. If you are looking for an affordable ADS-B Out solution, then the TN70 is the ideal compliment to any Trig transponder. The TN70 is simple to install and provides a cost effective way to add a certified WAAS GPS receiver to complete your ADS-B installation. 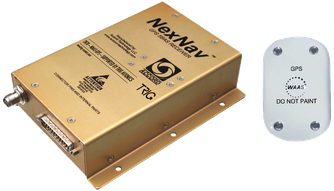 The TN70 is compatible with all Trig transponders. 2 to 4 place intercom with independent crew and passengers audio control. Supports 2 additional external inputs for alerts. Slide-in GMA340 replacement 2 to 6 place intercom with bluetooth, stereo audio, digital noise reduction and active mute.